We are a full line brokerage company of specializing in starter material for the wholesale nursery industry. We specialize in landscape color - groundcovers, Tuffy Plants, Daylilies, Liriope, Ornamental grasses, Palms (Tropical and cold hardy), Annuals, Perennials, Tropical plants, woody ornamentals, Crotons (unrooted cuttings and rooted liners) and Cordylines (air layers), Hosta, Ferns (hardy, perennial and tropical), Hosta and succulents, and tuberous bulbs (cannas, caladiums and Iris). Since 1991, we have been representing the best quality growers in the industry. 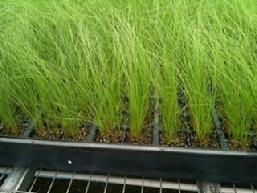 We offer product from over 50 different companies that produce 'young plants' for the wholesale nursery industry. The majority of our growers are located in the southeast for ease of transportation. We also import product from Puerto Rico and Costa Rica. We offer consistent quality backed with personal service. When you call us...you are talking with the owners. All it takes is one call to "Start with Us"! Note: If you are not a registered wholesale nursery member, may we suggest you contact your nearest professional retail garden center, wholesale/retail nursery for more information regarding the information that you see on our website. They would be more than happy to assist with your landscape needs.